Another day, another heist – life is exciting. 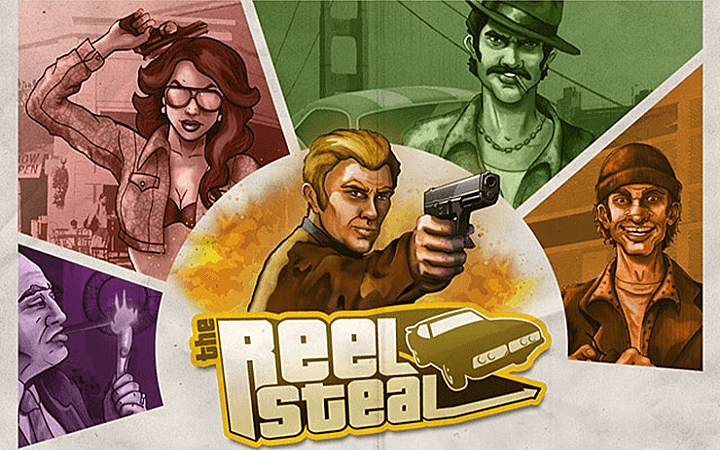 Reel Steel casino slot game is based on a heist, but this time it is set in the past: 70’s. NetEnt online slots used nice graphics and an amazing soundtrack; everything about the game reminds us those golden years – including gangsters. The game has 5 reels, 9 pay lines and a simple, straightforward ruleset which makes it a good choice even for beginners. Play at Casino Avenue to practice the free slots no download version of the game for free – you don’t even need a registration. There are five high-valued and four low-valued symbols in the game. High-valued ones consist of pictures of gang members; each one represents a different character. The payout ranges of the high-valued symbols are 10 to 1.500 coins. Low-valued symbols pay between 2 and 100 coins and are shown with pictures of heist related tools. There are only wild and scatter symbols in the game as for the special symbols. The wild symbol is represented by a picture of a yellow getaway car. It has two important features. First, wild substitutes for all other symbols (except scatter). Second, if wild is used to complete a winning combination in the game, it acts like a win multiplier and award you with 5x total winnings. This multiplier value becomes x25 during the free spins – a nice feature which brings huge payouts into the game. Scatter symbol is shown with a picture of a dynamite stick and three of them activates the free spins round. 3 scatters award you with 15, 4 scatters 20 and 5 scatters with 25 free games. During the feature, multiplier values raise up to x5. Now combine this with the x25 multiplier of the wild symbol – you can win up to 375.000 coins with one single spin and for free. Reel Steel online slot game by NetEnt has a coin value range of 0.01 to 0.50 coins. Playing with the maximum bet amount costs 90 coins; if you think of all of the features we explained above, a very humble value. If you like to play casino slots online and enormous payouts, we highly recommend trying Reel Steel.